For me the “new reading of Marx” was fundamental as an attempt at critical reconstruction of the revolutionary significance of Marx’s critique of political economy. What really does “critique” mean? Critique of what and for which purpose? The “new reading of Marx” taught me that it means a critique of economic categories, and that this critique entailed an attempt at deciphering economic categories as the objectified forms of definite social relations. When I encountered workerism, I was 19 years old. 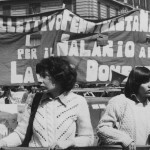 I was a grassroots militant of the students’ movement from the University of Padua. I was young, and thus I was silent and I learned. I remember that in many meetings I wanted to say things, but I was shy and insecure and therefore I preferred to keep quiet. The leaders of the movement were generally students who had already learned to do politics because they had some previous experience of party or political organizations. In contrast, I had only my beliefs about the need to change the world for the triumph of equality, freedom, and justice.